The Tour of California is one of RoadBikeReview’s favorite events since it is a huge event with world class racing right in our own back yard. The race will be held this May 11-18 and will run a total of more than 740 miles through 12 host cities. Stage 3 will start in San Jose and end up on one of our favorite Bay Area climbs, Mount Diablo State Park. This year marks the ninth edition of the Amgen Tour of California, being called “America’s largest and most prestigious professional cycling stage race”. Back this year is the north-to-south route with two mountain top finishes and scenic coastal riding along Highway 1. If you haven’t seen it before, you owe it to yourself as a cyclist to come and check out the scene. Even if you aren’t really in to the whole “racing” thing, there is plenty to see and enjoy just by being around fellow cycling aficionados. The organizers have created a route that is hoping to have some early excitement by forcing riders to face the longest stage, the fast and flat time trial, and the hardest stage in the first three days of racing. In past races, the time trial and Queen stages – which typically shape overall standings – came late in the race, and the leader after that point had to defend his top position for only one or two remaining days. This year, with several days of difficult racing to follow, it is likely 2014 race fans will see the coveted yellow leader jersey change hands throughout the week with top performers in close contention and challenging each other until the very finish. Day two will see the teams in nearby Folsom, for the 2014 Amgen Tour of Californiaindividual time trial, where riders race the clock one by one. Though the race has visited the historic gold rush town in the past, this will be the first time the city is hosting a stage. A short, flat course will reward the strongest rider and prove an honest test of who is riding well and who is not. Designed for speed, the 12.6-mile route will begin and finish in Folsom’s historic district. A start on Sutter Street will be followed by a turn onto Riley and a short downhill run onto the Rainbow Bridge and over the American River. The route will then turn north toward Folsom Lake. A right turn onto Folsom Lake Crossing will take the riders past the main entrance of California’s second oldest prison. A turn onto Green Valley will lead the riders to a 180-degree turn back over the same route to finish downtown. While there is a good chance Stage 2 will result in a new race leader, expect results to be close – no one can afford to lose time on this stage so early in the week, and racers will have to ride all out, even with the Queen stage in their sights the next day. 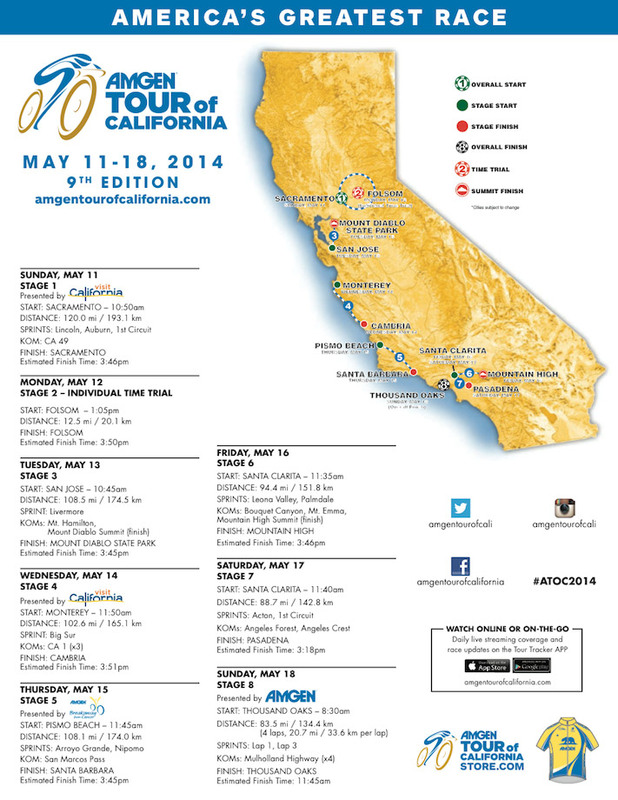 The Queen stage will come early in the 2014 Amgen Tour of California. Stage 3 will begin at the Lake Cunningham Regional Park on the east side of San Jose, which has the distinction of hosting a stage of the Amgen Tour of California for each of the nine years of the race. While the racers won’t see the south face of Mt. Hamilton from the start line, they will feel the beginning of the climb just five miles into the stage – the first time the course has winded this way to the summit of Mt. Hamilton. With 22 switchbacks, the long and steep climb is sure to be lined with thousands of spectators. The descent route will be shorter than the ascent, but steeper and much more technical. The long, rolling San Antonio Valley Road will quickly give way to twisty Mines Road, where it will be easy for a breakaway to form and quickly be out of sight of the peloton. As the riders skirt the east side of Livermore, the race will hook into last year’s route to Danville and the approach to Mt. Hamilton. The race up Mt. Hamilton in 2013 will still be fresh in many of the rider’s minds – the initial climb, the flat run to “The Junction“ and the final relentless push to the summit. The winner of the stage will almost certainly wear yellow on the podium. The question for the teams will be whether to defend the leader jersey for the rest of the race or save themselves for the race’s second mountaintop finish during Stage 6.